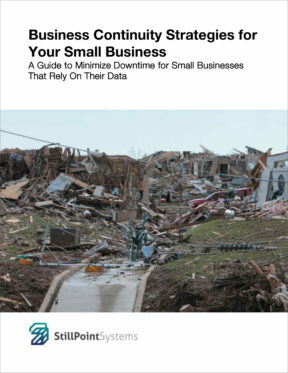 The ONLY true way to ensure that your data can be restored in the event of a disaster is by having a copy of it stored in an offsite location, preferably one with high security. That’s why a remote backup site is one of the most important aspects of a disaster recovery plan. Having a remote backup (also called an online backup, offsite backup, or managed backup) will allow you to keep a secure copy of your business’s data somewhere other than your office. Typically, this is done automatically after hours by uploading it to a high-security facility. While it’s undeniably important for you to have such a backup of your data, all the providers of such a service are certainly not created equal. A quality provider will ensure that if the worst happens, you’ll be able to recover your data quickly, easily, and without much effort. A poor service provider will afford you with no such benefit. Many businesses don’t know what to look for when choosing a service provider, but it’s imperative that they do. Countless companies offer such services as simply a way to make extra money, without much care that the data they’re backing up is secure and easily accessed. A quality provider won’t slap you with hidden fees, unexpected fine print, or by simply not backing up your data properly. So when that disaster hits, you find that your data isn’t there when you need it the most. HIPAA, Sarbanes-Oxley, Gram-Leach-Bliley, and SEC NASD compliance. Any company that deals with highly sensitive data (such as banks and medical facilities) must handle, store, and transfer their data according to these government regulations. Medical or financial institutions are required by law to only work with vendors who meet these strict regulations. But any company will benefit from also working with such providers since they will likely have high-level security measures in place. The site itself must be secure. High-level security measures will do you no good if someone can simply walk into the facility with a USB drive and walk off with sensitive information. Ensure that any provider you’re considering has an ID system, video surveillance, and a card-key system so that only authorized personnel may enter the site. To prevent hackers from access the data during transfer, ensure that it’s encrypted with SSL protocols. Geographically dispersed data centers. In other words, ensure that any provider you’re considering has backups of your backup, and that these backups are spread out geographically. That way, if one their facilities suffers from a disaster, then they won’t lose the only copy of your data that they had. These types of redundancies are common in data security. Insist on physical data. If a disaster strikes, the last thing you want is to have to wait while you download all your data from an offsite location, especially if the size of that data ranges in the terabytes. Recovering that much data could take days if not weeks. Any provider you’re considering must be prepared to send you a physical copy of your data, either on DVDs or other storage devices overnight. Similarly, see if your service provider will allow you to provide your initial backup through a hard copy. If you’ll be downloading that much data in the event of a disaster is a herculean task, then the initial upload will be just as long, so it can help to save time by uploading the data through other storage devices. Ensure that different computers can be used in restoring your data. Some lower-end backup providers will only be able to restore your data back onto the original machine it came from. So if the original computer was otherwise lost, then you will have no way of restoring your backup. Insist on daily reports of your backup. All things considered, backups are simply data, and data can degrade over time. So it’s imperative that your provider sends you a daily report, showing that your backup ran, and if there were any issues, that those are reported as well. The better providers will also be capable of sending these reports to other people as well, such as your IT professionals. Enlist the help of qualified technicians. While many backup services are fully automated and likely won’t be there to help you with the backup or restoration process, you should at least ask for help from a professional. By improperly setting up your backup, you could potentially lose all your data when the time comes to restore it. This makes it even more important to go with a quality provider, one that will have someone ready to talk with you to make sure you’ve backed everything up properly. While everything above is important, there is one thing that sits above it all, and is often neglected. A quality service provider should be willing to regularly test your backup to ensure that the data can be recovered when the time comes. The last thing you want to do is wait until you need to restore your data to perform a restore. Doing so may only cost you. Sensitive data should be tested monthly, but less critical data can be tested quarterly. There is plenty that can corrupt your backup. Testing it monthly will ensure that you have a quality copy of your data waiting for you in the event that you need it.